Before "Twilight" and "True Blood," audiences sank their fangs into 1972's "Blacula." Audiences soon will experience this classic film "drive-in" style during UHD's Sixth Annual Halloween Outdoor Film Screening. 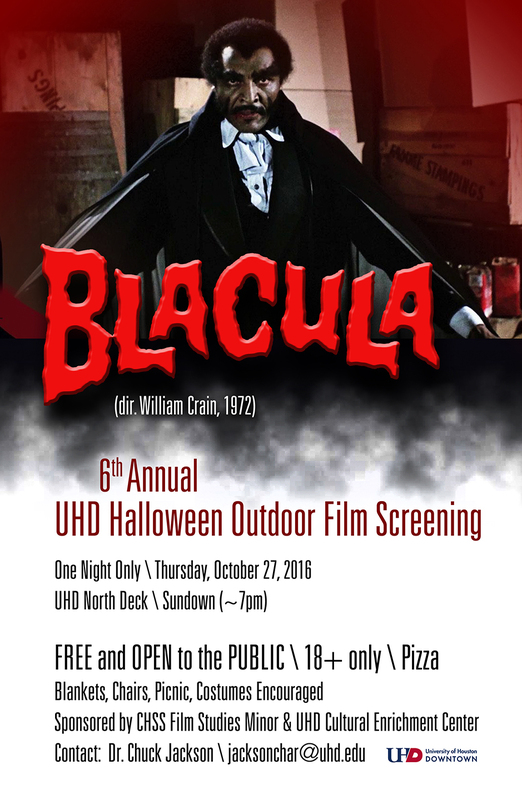 "Blacula" will be screened at 7 p.m., Thursday, Oct. 27 on UHD's North Deck. This event is free and open to the UHD community and the public. Pizza will be served, and audiences can bring lawn chairs and blankets. In keeping with the Halloween theme, patrons also are encouraged to wear costumes. Organizers selected "Blacula" for this year's screening following a discussion that emerged during the 2015 Halloween event. That year's movie, "Night of the Living Dead," explored issues of race and national emergency. "Many classic films in the U.S. horror genre don't address or feature people of color," said Chuck Jackson, UHD associate professor of English and coordinator of the Film Studies Minor. "'Blacula' is a game changer. It is the first vampire film to be directed by an African American and the first to feature an African American in the lead role." cted by William Crain and features esteemed actor William Marshall in the title role. The plot focuses on Prince Marmuwalde (Marshall) of Africa, who is transformed into a vampire by Count Dracula in the 16th century. He awakens in the 20th century in search of his long lost love Luva (Vonetta McGee) and on the hunt for victims. "It's a fitting movie, and one that still holds up," Jackson said. "And it's perfect for the season. I think audiences will find this to be and provocative selection for our annual screening." UHD English students Rodney Remo, Maral Rezvani and Lindsay Ware will lead a short discussion on stereotypes and subversions in the film before the screening. In the event of rain, the screening will be relocated to N1099. UHD's Halloween Film Screenings are among the city's popular October activities. In previous years, the Houston Press named it the Best Free Halloween Event in Houston. Screenings are presented by UHD's Film Studies Minor program and the Cultural Enrichment Center. For more details or to RSVP, visit the event's Facebook page.